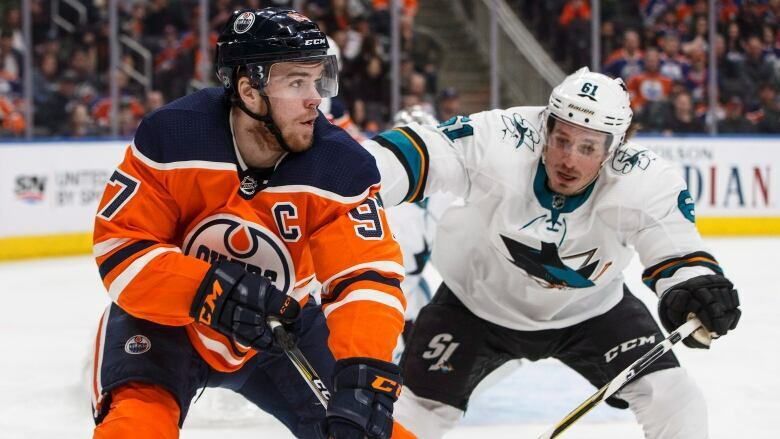 Tomas Hertl had a pair of goals, including the overtime winner, as the San Jose Sharks pulled out a 4-3 victory over the Edmonton Oilers on Wednesday. Resiliency was the watchword for the San Jose Sharks on Wednesday. Tomas Hertl had a pair of goals, including the overtime winner, as the Sharks came from behind on three separate occasions before pulling out a 4-3 victory over the Edmonton Oilers. "The mentality all year has just been to stick with it," said Brenden Dillon, who also had a goal in the game for San Jose. "A big thing for us is that we can kind of lean on is that we are a never quit team and we were able to come back as the game went on. Logan Couture also scored and added a pair of assists for the Sharks (38-23-9), who have won two straight and currently sit three points up on the L.A. Kings for second place in the Pacific Division. "We are all watching the standings and there is not much room for error right now," said Sharks captain Joe Pavelski. "It is tight. We knew how important the points were tonight and it was a great job of the guys continuing to battle back. It was nice to get that extra point in overtime. It is really big for us right now." Drake Caggiula, Oscar Klefbom and Ryan Nugent-Hopkins responded as Edmonton (30-35-5) lost its second game in a row. "Just a few individuals with some tough nights that created some turnovers," said Oilers head coach Todd McLellan. "Our backup goaltender gives us a performance like that, I thought we should be able to close it off. "I thought we got a little bit tired at the end. Some guys have played a lot of hockey in the last few days and it showed a little bit at the end." Zack Kassian hooked a backhand pass from behind the net out front to Caggiula, who slipped a shot past Sharks starter Martin Jones as Edmonton took the lead 2:39 into the first. Hertl converted on a two-on-one break, beating Oilers backup Al Montoya for his 17th goal of the season, to tie it up eight minutes into the game. Klefbom put away a long point shot eight minutes into the second to retake the lead. The goal withstood a video review. San Jose tied it up a couple of minutes later with Caggiula serving a double-minor when Couture moved in from the top of the circle and beat Montoya with a wrist shot for his 28th of the campaign. Edmonton made it 3-2 early in the third when Nugent-Hopkins tipped a Klefbom shot in for his 19th, with McDavid picking up his second assist of the night to give him 86 points on the season. The Sharks knotted the game up yet again nine minutes into the third on a long shot through traffic by Dillon. The Sharks play the second of a three-game Western Canadian trip in Calgary on Friday, while the Oilers embark on a four-game trip in Florida against the Panthers on Saturday.